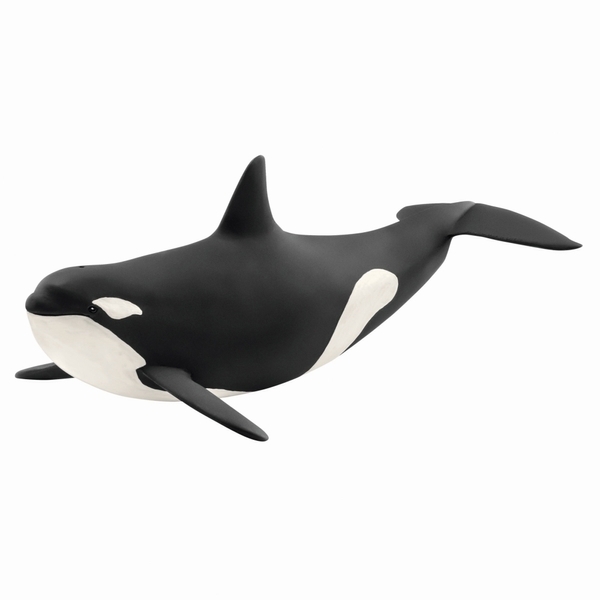 Orcas, also called "killer whales", are related to dolphins and considered the world’s largest predators in the ocean. Orcas are adaptable, social animals that are native to almost all the oceans. Their food depends on their respective environment. Orcas prefer pinnipeds, walruses, sea lions and even other whales. Their family groups rank among the strongest in the animal kingdom. At the time they are born, the calves are coloured yellowish or orange, but in the course of time their skin turns white. Grown orcas have a length of up to eight metres and weigh about nine tons. Males and females can be distinguished by their dorsal fins. Males have triangular fins with a length of more than 1.5 meters, while the fins of the females are roughly half the size and often bent. Both male and female orcas are able to reach up to fifty years of age.